The team members at Emeryville Animal Hospital are knowledgeable and highly-trained in a wide variety of surgical procedures. If your pet requires surgery, we will explain everything you need to know in order to make the experience less stressful and traumatic for both you and your animal companion. We take every precaution to make sure they are as comfortable and as relaxed as possible so that they can be returned to you healthy and happy. 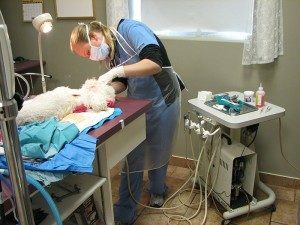 At some time in your pets life, he or she may need to go under anesthesia for surgery or to have his or her teeth cleaned. At our hospital, each patient has one or more technicians dedicated full time to your pet’s anesthetic monitoring under the care of your veterinarian. We take anesthesia and surgery very seriously. Our monitoring first starts with blood collected for testing before the procedure to make sure your pet’s organs are functioning normally, and to catch any underlying abnormalities to alert us if we need to take any precautions. Each patient that undergoes an anesthetic is given then a specific drug protocol tailored specifically to your pet based on their pre-surgical bloodwork, age, breed, species and the procedure in which they are undergoing. Each patient undergoing anesthesia at EAH are placed on intravenous fluids. Intravenous fluids help us maintain blood pressure on your pet while under anesthetic and provide us access to their bloodstream if needed to give medications or in an emergency. We have two Doppler machines at EAH that monitor blood pressure. The Doppler is a non-invasive machine that quickly determines blood pressure by a cuff that is placed on your pet’s paw. Our pulse oximeter uses a non-invasive probe that is placed on the tongue, ear or paw to measure the amount of oxygen that is dissolved in the bloodstream and carried by red blood cells. This ensures that a patient is receiving adequate amounts of oxygen and alerts us if there is a problem. An electrocardiogram is a machine that has tiny pads hooked up to your pet’s chest to monitor heart deficiencies. This machine detects and amplifies tiny electrical charges on the skin that are caused when the heart muscles “depolarizes” during each heartbeat. Temperature, pulse, and respiration are monitored continuously during any procedure. We prefer to do this manually and by a number of other monitors in combination as a safe guard for successful anesthesia.